Click here to access an Excel file (330kb) which provides details on journals that have published articles and reviews on Kierkegaard between 1995 and 2010.
to provide some data on where and how often Kierkegaard is being published. The Overview sheet provides a series of tables and graphs outlining where Kierkegaard articles and reviews have appeared in the last 14 years. The Data sheet provides a list of all papers included in the underlying data. The Journals tab provides information on journal editorial policies, frequency, word limits, number of Kierkegaard items published, and how each journal is ranked according to various sources – most notably the European Science Foundation’s European Reference Index for the Humanities (although see the note on journal rankings below). The data includes journals publishing in all areas of the Humanities and Social Sciences. 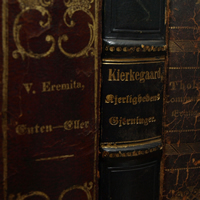 It does not include articles published in specialist Kierkegaard Studies publications (Kierkegaardiana, Kierkegaard Studies Yearbook, Kierkegaard Studiet etc. ); articles appearing in undergraduate journals; and (for the time being) articles published in languages other than English. The data has been sourced from Philosopher’s Index, Google Scholar, and direct searches on journal websites. Additions, comments, corrections and suggestions are most welcome.